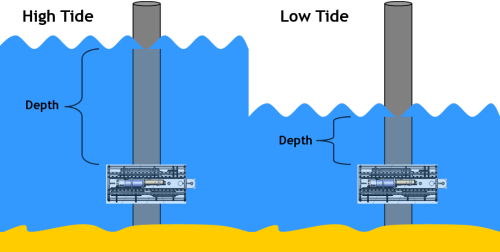 Depth reported by SCCF RECON is the depth of the water above the sensor. This changes as a result of the tides. The sensor is suspended off of the bottom so as the tides go up and down the amount of water above the sensor changes. In Southwest Florida we experience mixed tides. These consist typically of two high and two low tides of different heights each tidal day (24 hours 50 minutes). Twice monthly the sun, moon, and earth are in line. On one occasion the moon is between the sun and the earth and on another occasion the earth is between the sun and moon. During these alignments the tide-producing forces of the sun and the moon are additive and the range of tides is the highest of the month. This means the high tides ascend higher and the low tides recede lower than any other time of the month. These tides are called spring tides, though they have nothing to do with the season of the year. 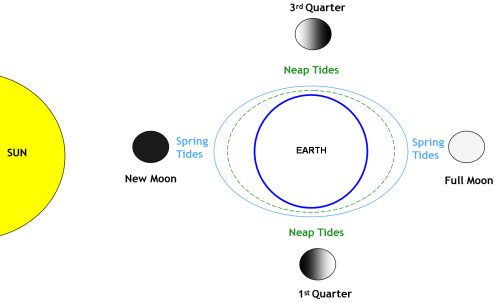 When the sun and moon are at right angles with the earth neap tides are formed. These tides also occur twice a month and produce the lowest tidal range of the month.